Metro Bhawan, Barakhamba Road, New Delhi – 110001. The Delhi Metro is a rapid transit system serving Delhi and its satellite cities of Bahadurgarh, Ballabhgarh, Faridabad, Ghaziabad, Gurugram, and Noida in the National Capital Region of India. By far the largest and busiest metro in India, and second oldest after the Kolkata Metro it is the world's 8th longest metro system and 16th largest by ridership. The network consists of eight colour-coded regular lines, running 343 kilometres (213 mi) serving 250 stations. The system has a mix of underground, at-grade, and elevated stations using both broad-gauge and standard-gauge. Delhi Metro operates over 2,700 trips daily, starting at around 05:00 and ending at 23:30 hrs. Delhi Metro also interchanges with the Rapid Metro Gurgaon (with a shared ticketing system) and Noida Metro. On 5 February 2019, the DMRC took over the operations of the financially troubled Rapid Metro Gurgaon as part of its own network. Making it the second time the DMRC has taken over a privately operated line after absorbing the Delhi Airport Metro Express. The concept of a mass rapid transit for New Delhi first emerged from a traffic and travel characteristics study which was carried out in the city in 1969. Over the next several years, many official committees by a variety of Government departments were commissioned to examine issues related to technology, route alignment, and Governmental jurisdiction. In 1984, the Urban Arts Commission came up with a proposal for developing a multi-modal transport system, which would consist of constructing three underground mass rapid transit corridors as well augmenting the city's existing suburban railway and road transport networks. While extensive technical studies and the raising of finance for the project were in progress, the city expanded significantly resulting in a twofold rise in population and a fivefold rise in the number of vehicles between 1981 and 1998. Consequently, traffic congestion and pollution soared, as an increasing number of commuters took to private vehicles with the existing bus system unable to bear the load. An attempt at privatising the bus transport system in 1992 merely compounded the problem, with inexperienced operators plying poorly maintained, noisy and polluting buses on lengthy routes, resulting in long waiting times, unreliable service, extreme overcrowding, unqualified drivers, speeding and reckless driving. To rectify the situation, the Government of India and the Government of Delhi jointly set up a company called the Delhi Metro Rail Corporation (DMRC) on 3 May 1995, with E. Sreedharan as the managing director. Dr. E. Sreedharan handed over the charge as Managing Director of DMRC to Mangu Singh on 31 December 2011. Physical construction work on the Delhi Metro started on 1 October 1998. After the previous problems experienced by the Kolkata Metro, which was badly delayed and 12 times over budget due to "political meddling, technical problems and bureaucratic delays", DMRC is a special-purpose organisation vested with great autonomy and powers to execute this gigantic project involving many technical complexities, under a difficult urban environment and within a very limited time frame. DMRC was given full powers to hire people, decide on tenders and control funds. The DMRC then hired the Hong Kong MTRC as a technical consultant on rapid transit operation and construction techniques. As a result, construction proceeded smoothly, except for one major disagreement in 2000, where the Ministry of Railways forced the system to use broad gauge despite the DMRC's preference for standard gauge. The first line of the Delhi Metro, the Red Line, was inaugurated by Atal Bihari Vajpayee, the then Prime Minister of India on 24 December 2002. The Delhi Metro became the second underground rapid transit system in India, after the Kolkata Metro, when the Vishwa Vidyalaya–Kashmere Gate section of the Yellow Line opened on 20 December 2004. This underground line was inauguated by the then Prime Minister Manmohan Singh. The first phase of the project was eventually completed in 2006, on budget and almost three years ahead of schedule, an achievement described by Business Week as "nothing short of a miracle". On 19 October 2008, a launching gantry and a part of the overhead Blue Line extension under construction in Laxmi Nagar, East Delhi, collapsed and fell on passing vehicles underneath. Workers were using a crane to lift a 400-tonne concrete span of the bridge when the gantry collapsed along with a 34-metre-long (112 ft) span of the bridge on top of a Blueline bus, killing the driver and a labourer. On 12 July 2009, a section of a bridge collapsed while it was being erected at Zamrudpur, near East of Kailash, on the Central Secretariat – Badarpur corridor. Six people died and 15 were injured. The following day, on 13 July 2009, a crane that was removing the debris collapsed, and with a bowling pin effect collapsed two other nearby cranes, injuring six. On 22 July 2009, a worker at Ashok Park Metro station was killed when a steel beam fell on him. Over a hundred people, including 93 workers, have died since work on the metro began in 1998. On 23 April 2018, five people were injured when an iron girder fell off the elevated section of a Metro rail structure being constructed at the Mohan Nagar intersection in Ghaziabad. A car, an auto rickshaw and a motorbike were also damaged in the accident. The Delhi Metro is being built in phases. Phase I consisted of 58 stations and 65.0 km (40.4 mi) of route length, of which 13.0 km (8.1 mi) is underground and 52.1 km (32.4 mi) surface or elevated. The inauguration of the Dwarka–Barakhamba Road corridor of the Blue Line marked the completion of Phase I in October 2006. Phase II of the network consists of 124.6 km (77.4 mi) of route length and 85 stations, and is fully completed, with the first section opened in June 2008 and the last line opened in August 2011. Phase-III has 28 underground stations, 2 new lines and 11 route extensions, totaling 167.27 km (103.94 mi), with a cost of ₹350 billion (US$4.9 billion) and having an expected completion date of mid 2019. Phase IV (113.2 km or 70.3 mi) is planned to be completed by 2024. A total of 65 kilometres (40 mi) long network with 59 stations and the following 3 routes (initial parts of Red, Yellow and Blue lines) were built within the limits of Delhi state, stations progressively started to open from 25 December 2002 to 11 November 2006. A total of 124.90 kilometres (77.61 mi) long network with 86 stations and the following 10 new routes and extensions was built, out of which seven routes are extension spurs of the Phase I network, three were new colour-coded lines and three routes connect to other cities (Yellow Line to Gurgaon, Blue Line to Noida and Blue Line to Ghaziabad) of the national capital region, outside the physical limits of Delhi state, in the states of Haryana and Uttar Pradesh. At the end of Phases I and II, the cumulative total length of the network became 189.90 km (118.00 mi) with 151 stations progressively becoming operational from 4 June 2008 to 27 August 2011. Phase-I (Red, Yellow and Blue lines) and phase-II (Green, Violet and Orange lines) had focused on adding new radial lines to expand the network. To reduce the congestion and improve the connectivity, Phase-III includes 11 extensions to the existing lines as well as building two ring lines (Pink and Magenta lines). Phase-III has 28 underground stations, 2 new lines and 11 route extensions, totaling 167.27 km (103.94 mi), with a cost of ₹350 billion (US$4.9 billion). Phase 3 contains 3 new Lines in Delhi Metro System, Pink Line running on Inner Ring Road (Line 7), Magenta Line running on Outer Ring Road (Line 8) & Gray Line connecting Dwarka and Najafgarh (Line 09). Work on Phase III started in 2011, with 2016 being the planned deadline, more than 20 tunnel boring machines were used simultaneously to expedite the work, however, the actual work for the original was completed in March 2019, (except for a small stretch due to non-availability of land). Later, certain small extensions to the Delhi Metro were added as part of the Phase - III project which are still under-construction and expected to get completed by 2020. Kalkaji Mandir to Botanical Garden section of Magenta Line was inaugurated by Prime Minister Narendra Modi on Christmas 2017, making it the first driverless metro line of Delhi Metro. The expected daily ridership of the whole network of all phases, after the completion of Phase-III, is 4 million passengers. The communication-based train control (CBTC) is being used in Phase-III trains which enables trains to run at a short headway of 90 seconds. Keeping this in mind and other constraints, DMRC changed its decision to build 9-car-long stations for new lines and instead opting for shorter stations which can accommodate 6-car trains. Delhi Metro was planned to be built in phases spread over around 20 years as with each phase having a target of five years and end of one phase marking the beginning of another. Phase I (65 km or 40 mi), Phase II (125 km or 78 mi) were completed in 2006 and 2011, respectively. Phase III lines are expected to be completed by mid 2019, a delay of 3 years from the originally planned timeline of 2016. Currently, the Phase IV plan approved by the Delhi Government is expected to add another 103 kilometres (64 mi) and may commence in 2019 with an expected completion date of 2025. This makes the total length of the Delhi Metro at the end of Phase IV to exceed 450 kilometres (280 mi), which does not include other independently operated systems in the National Capital Region such as the 29.7 kilometres (18.5 mi) long Aqua Line of the Noida-Greater Noida Metro and the 11.7 kilometres (7.3 mi) of the Rapid Metro Gurgaon that connect to the Delhi Metro. Phase IV with 6 new routes, with total length of 103.95 kilometres (64.59 mi) and cost of at least ₹450 billion (equivalent to ₹470 billion, US$6.6 billion or €5.7 billion in 2018), were approved in December 2018. The Red Line was the first line of the Metro to be opened and connects Rithala in the west to Shaheed Sthal (New Bus Adda) in the east, covering a distance of 34.69 kilometres (21.56 mi). It is partly elevated and partly at grade and crosses the Yamuna River between Kashmere Gate and Shastri Park stations. The inauguration of the first stretch between Shahdara and Tis Hazari on 24 December 2002 caused the ticketing system to collapse due to the line being crowded to four times its capacity by citizens eager to have a ride. Subsequent sections were inaugurated from Tis Hazari – Trinagar (later renamed Inderlok) on 4 October 2003, Inderlok – Rithala on 31 March 2004, and Shahdara – Dilshad Garden on 4 June 2008. The red line has interchange stations, at Kashmere Gate with the Yellow Line and Violet Line, at Inderlok with the Green Line & at Netaji Subhash Place & Welcome with the Pink Line. In the future the red line will have an interchange with the Blue Line at Mohan Nagar. Beginning 24 November 2013, a total of six-coach trains were eventually commissioned on the Red Line. On 8 March 2019, extension of the line from Dilshad Garden to Shaheed Sthal(New Bus Adda) was opened for public by Prime Minister Narendra Modi. The Yellow Line was the second line of the Metro and was the first underground line to be opened on the Delhi Metro. It runs for 49 kilometres (30 mi) from north to south and connects Samaypur Badli with HUDA City Centre in Gurgaon. The northern and southern parts of the line are elevated, while the central section which passes through some of the most congested parts of Delhi is underground. The first underground section of Delhi Metro between Vishwa Vidyalaya and Kashmere Gate opened on 20 December 2004, and the subsequent sections of Kashmere Gate – Central Secretariat opened on 3 July 2005, and Vishwa Vidyalaya – Jahangirpuri on 4 February 2009. This line also possesses the country's second deepest Metro station at Chawri Bazar, situated 25 metres (82 ft) below ground level. On 21 June 2010, an additional stretch from Qutub Minar to HUDA City Centre was opened, initially operating separately from the mainline. However, Chhatarpur station on this line opened on 26 August 2010. Due to delays in acquiring the land for constructing the station, it was constructed using prefabricated structures in a record time of nine months and is the only station in the Delhi Metro network to be made completely of steel. The connecting link between Central Secretariat and Qutub Minar opened on 3 September 2010. On 10 November 2015, the line was further extended between Jahangirpuri and Samaypur Badli in Outer Delhi. Interchanges are available with the Red Line and Kashmere Gate ISBT at Kashmere Gate, Blue Line at Rajiv Chowk, Violet Line at Kashmere Gate & Central Secretariat, Airport Express (Orange) Line at New Delhi, Pink Line at Azadpur & INA, Magenta Line at Hauz Khas, Rapid Metro Gurgaon at Sikandarpur and with the Indian Railways network at Chandni Chowk and New Delhi. The Yellow Line is the first line of Delhi Metro which has phased out all four coach trains with six and eight coach configuration. The Metro Museum at Patel Chowk Metro station is a collection of display panels, historical photographs and exhibits, tracing the genesis of the Delhi Metro. The museum was opened on 1 January 2009. The Blue Line was the third line of the Metro to be opened and the first to connect areas outside Delhi. Mainly elevated and partly underground, it connects Dwarka Sub City in the west with the satellite city of Noida in the east, covering a distance of 56.61 kilometres (35.18 mi). The first section of this line between Dwarka and Barakhamba Road was inaugurated on 31 December 2005, and subsequent sections opened between Dwarka – Dwarka Sector 9 on 1 April 2006, Barakhamba Road – Indraprastha on 11 November 2006, Indraprastha – Yamuna Bank on 10 May 2009, Yamuna Bank – Noida City Centre on 12 November 2009, and Dwarka Sector 9 – Dwarka Sector 21 on 30 October 2010. This line crosses the Yamuna River between Indraprastha and Yamuna Bank stations, and has India's second extradosed bridge across the Northern Railways mainlines near Pragati Maidan. A branch of the Blue line, inaugurated on 8 January 2010, takes off from Yamuna Bank station and runs for 6.25 kilometres (3.88 mi) up to Anand Vihar in east Delhi. It was further extended up to Vaishali which was opened to the public on 14 July 2011. A small stretch of 2.76 kilometres (1.71 mi) from Dwarka Sector 9 to Dwarka Sector 21 was inaugurated on 30 October 2010. On 9 March 2019, a 6.67 km extension of the line from Noida City Centre to Noida Electronic City was opened for public by Prime Minister Narendra Modi. Interchanges are available with the Noida Sector 51 station of Aqua Line (Noida Metro) at Noida Sector 52 station, Yellow Line at Rajiv Chowk station, Green Line at Kirti Nagar, Violet Line at Mandi House, Delhi Airport Metro Express (Orange) Line at Dwarka Sector 21, Pink Line at Rajouri Garden, Mayur Vihar Phase-I, Karkarduma & Anand Vihar, Magenta Line at Janakpuri West & Botanical Garden and with the Indian Railways network and Interstate Bus Station (ISBT) at Anand Vihar station, which connects with Anand Vihar Railway Terminal and Anand Vihar ISBT. In the future it will have an interchange with the Red Line at Mohan Nagar. Opened in 2010, Green Line (Line 5) is the fifth line of the Delhi Metro network and the first line on standard gauge, as opposed to previous broad gauge lines. It runs between Inderlok (station on the Red Line) and Brigadier Hoshiyar Singh with a branch line connecting the line's Ashok Park Main station with Kirti Nagar station on the Blue Line. The completely elevated line, built as part of the Phase-II of Delhi Metro runs mostly along the busy NH 10 route in West Delhi. The line consists of 23 stations including an interchange station covering a total length of 29.64 km (18.42 mi). This line also has the country's first standard-gauge maintenance depot at Mundka. The line was opened in two stages, with the 15.1 km (9.4 mi) Inderlok – Mundka section opening on 3 April 2010 and the 3.5 km (2.2 mi) Kirti Nagar – Ashok Park Main branch line on 27 August 2011. On 6 August 2012, in a step that will improve commuting in National Capital Region, the Union Government approved an extension of Delhi Metro from Mundka to Bahadurgarh in Haryana. The 11.18 km (6.95 mi) metro stretch have seven stations at Mundka Industrial Area, Ghevra, Tikri Kalan, Tikri Border, Pandit Shree Ram Sharma, Bahadurgarh City and Brigadier Hoshiyar Singh between Mundka and Bahadurgarh. This stretch was opened on 24 June 2018. Interchanges are available with Red Line at Inderlok and Blue Line at Kirti Nagar. The Violet Line is the sixth line of the Metro to be opened, and the second standard-gauge corridor after the Green Line. The 47-kilometre-long (29 mi) line connects Raja Nahar Singh in Ballabgarh via Faridabad to Kashmere Gate in New Delhi, with 26 km (16 mi) being overhead and the rest underground. The first section between Central Secretariat and Sarita Vihar was inaugurated on 3 October 2010, just hours before the inaugural ceremony of the 2010 Commonwealth Games, and connects the Jawaharlal Nehru Stadium, which was the venue for the opening and closing ceremonies of the event. Completed in just 41 months, it includes a 100-metre-long (330 ft) bridge over the Indian Railways mainlines and a 167.5-metre-long (550 ft) cable-stayed bridge across an operational road flyover and connects several hospitals, tourist attractions, and a major industrial estate along its route. Services are provided at intervals of 5 min. An interchange with the Yellow Line is available at Central Secretariat through an integrated concourse. On 14 January 2011, the remaining portion from Sarita Vihar to Badarpur was opened for commercial service, adding three new stations to the network and marking the completion of the line. The section between Mandi House and Central Secretariat, was opened on 26 June 2014. After that, a 971-metre section between ITO and Mandi House was opened on 8 June 2015. A 14 km (8.7 mi) extension southwards till Escorts Mujesar in Faridabad was inaugurated by Prime Minister Narendra Modi on 6 September 2015. All the nine Metro stations of the Badarpur – Escorts Mujesar (Faridabad) section of Delhi Metro's Phase 3, have been awarded the highest possible rating (platinum) for adherence to green building norms, by the Indian Green Building Council (IGBC), which has devised a rating mechanism for Metro stations and buildings on a scale of platinum, gold, silver etc. for following the green building specifications. The awards for these stations were given to DMRC's Managing Director, Dr. Mangu Singh by Dr. P C Jain, Chairperson, IGBC in the presence of DMRC's directors and senior officials on 10 September 2015. Currently, the Faridabad corridor of Delhi Metro Violet Line is the longest metro corridor outside of Delhi, consisting of 11 stations and the total length of corridor being 17 km (11 mi). On 28 May 2017, the ITO – Kashmere Gate corridor of the Delhi Metro was formally flagged off for passenger services by the Union Minister of Urban Development, M. Venkaiah Naidu and the Chief Minister of Delhi, Arvind Kejriwal. This section which runs underground is popularly known as the Heritage Line. Interchanges are available with Red Line at Kashmere Gate, Yellow Line at Kashmere Gate & Central Secretariat, Blue Line at Mandi House, Pink Line at Lajpat Nagar & Magenta Line at Kalkaji Mandir. The Airport Express line runs for 22.7 km (14.1 mi) from New Delhi Railway Station to Dwarka Sector 21, linking the Indira Gandhi International Airport. The line was operated by Delhi Airport Metro Express Pvt. Limited (DAMEL), a subsidiary of Reliance Infrastructure, the concessionaire of the line till 30 June 2013 and is now being operated by DMRC. The line was constructed at a cost of ₹57 billion (US$790 million), of which Reliance Infrastructure invested ₹28.85 billion (US$400 million) and will pay fees on a revenue-share model. The line has six stations (Dhaula Kuan and Delhi Aerocity became operational on 15 August 2011), with some featuring check-in facilities, parking, and eateries. Rolling stock consists of six-coach trains operating at intervals of ten minutes and having a maximum speed of 135 km/h (84 mph). Originally scheduled to open before the 2010 Commonwealth Games, the line failed to obtain the mandatory safety clearance and was opened on 24 February 2011, after a delay of around 5 months. After 16 months of commencement of operations, the line was shut down for repairs of the viaducts on 8 July 2012. The line reopened on 22 January 2013. On 27 June 2013 Reliance Infrastructure Ltd intimated DMRC that they are unable to operate the line beyond 30 June 2013. Following this DMRC took over operations of Airport Express line from 1 July 2013 with an Operations and Maintenance team of 100 officials to handle the line. In Jan 2015, DMRC reported that Airport Metro has recorded about 30 percent rise in its ridership following the fare reduction of up to 40 percent in July last year On 14 September 2015 DMRC announced to reduce fares even further to improve the ridership of the line, the new fare structure will have maximum fare of ₹60 and minimum of ₹10 instead of ₹100 and ₹20 charged earlier, a reduction of about 40%. DMRC has stated that this was done to reduce the crowding on Blue line, diverting some of the Dwarka-bound passengers to Airport Express Line, which is underutilised and faster compared to the Blue Line. Interchanges are available with Yellow Line at New Delhi, Blue Line at Dwarka Sector 21, Durgabai Deshmukh South Campus metro station of Pink Line at Dhaula Kuan & with the Indian Railways network at New Delhi. The Pink Line is the second new line of the Third Phase of the Delhi Metro that was partially opened on 14 March 2018, with a further extension opening on 6 August 2018. Currently, the line is opened between Majlis Park to Mayur Vihar Pocket I and Trilokpuri Sanjay lake to Shiv Vihar. On 31 October 2018, Trilokpuri Sanjay Lake to Shiv Vihar section is opened. On 31 December 2018, Lajpat Nagar to Mayur Vihar Pocket I section opened. Only 1.5 km between Mayur Vihar Pocket I to Trilokpuri Sanjay Lake is left due to land issue. It consists of 38 metro stations from Majlis Park to Shiv Vihar, both in North Delhi. Upon completion, the Pink Line with a length of 58.59 kilometres (36.41 mi), will be the longest line in Delhi Metro, breaking the record set by the operational Blue Line(excluding branch line). It will be mostly elevated and will cover Delhi in an almost 'U' shaped pattern. The Pink Line is also known as the Ring Road Line, as the entire line passes alongside the busy Ring Road in Delhi, that witnesses massive traffic jams everyday. The Pink line has interchanges with most of the operational lines of the network such as the Red Line at Netaji Subhash Place & Welcome, Yellow Line at Azadpur & INA, Blue Line at Rajouri Garden, Mayur Vihar Phase-I, Anand Vihar & Karkarduma, Dhaula Kuan of Delhi Airport Metro Express (Orange Line) at Durgabai Deshmukh South Campus, Violet Line at Lajpat Nagar, as well as with Hazrat Nizamuddin and Anand Vihar Terminal (Indian Railways) and the ISBT's at Anand Vihar and Sarai Kale Khan. The Pink Line has the highest point of Delhi Metro at Dhaula Kuan with a height of 23.6 metres, passing over the Dhaula Kuan grade separator flyovers and the Airport Express Line. The Magenta Line is the first new line of the Third Phase of the Delhi Metro that was partially opened on 25 December 2017 between Botanical Garden and Kalkaji Mandir. The entire length of the line was inaugurated on 28 May 2018. It consists of 25 metro stations from Janakpuri West to Botanical Garden. The Magenta Line provide direct connectivity to Terminal 1D of Indira Gandhi International Airport. The Hauz Khas station on this line and the current Yellow Line is the deepest Metro station at a depth of 29 metres, surpassing the record set by Chawri Bazaar station on the Yellow Line, at a depth of 22 metres. The Shankar Vihar metro station on this line is a unique station because at this station nobody is allowed to go outside of metro station without any ID. It is because this station is located in the cantonment area of the Army. The Magenta line has interchanges with the Yellow Line at Hauz Khas, Blue Line at Janakpuri West and Botanical Garden, and Violet Line at Kalkaji Mandir of the Delhi Metro network. The Grey Line also known as (Line 9) is an upcoming line that will connect Dwarka to Dhansa Bus Stand in the western part of Delhi. It will cover around 4.295 km and comprises 4 station Dhansa Bus Stand, Najafgarh, Nangli and Dwarka. The line will have an interchange with Blue Line at Dwarka Station and is scheduled to be operational by September 2019. The upcoming line is expected to improve connectivity to Najafgarh and Dhansa Bus Stand, both of which are congested and busy areas in the national capital. After taking over the operation of the Delhi Airport Express Metro, the Delhi Metro Rail Corporation (DMRC) is going to take over the operation of Gurugram Rapid Metro. In this regard, an agreement between the Haryana Government and the DMRC has been signed. According to sources, the DMRC will take the complete operation of Gurugram Rapid Metro from February 5. However, no changes will be made in the fares and timings of the Metro, and the staff will not be changed yet, but in the future, DMRC will find out the possibility of how the Gurugram Rapid Metro can be made more useful. The Rapid Metro was built on the PPP model by the Haryana Government. Under this, a closed circle of Rapid Metro was made between Gurugram Sector 55-56 to Phase II. There are 11 stations on this corridor totaling a length of 12 km. These include some busy stations like Cyber City, Belvedere Tower, Sikanderpur, Maulsari Avenue, Sector 55-56 and Sector 54 Chowk. Sekanderpur station is also an interchange station of the Yellow Line of Delhi Metro. Now the entire operation of Rapid Rail will be in the control of DMRC itself. From February 5, DMRC will maintain a separate account for the Rapid Metro on the lines of the Delhi Airport Metro, in which the details of expenditure on metro revenue and operating expenses will be recorded. It is being reported that due to the low number of passengers in the Rapid Metro in Peak Hour, it was facing a lot of difficulty in its operation. In view of this, the Haryana Government decided to hand over the Gurugram Rapid Metro to the Delhi Metro Rail Corporation (DMRC). Western Peripheral Expressway metro in Haryana along the existing road expressway. Yamuna Bank – Loni Border: 12 kilometres (7.5 mi) long, dropped from Phase IV expansion. Najafgarh – Narela: proposed for inclusion during the planning of Phase III to be constructed in either Phase III or Phase IV but subsequently dropped for both. A similar line was proposed again during the later stages of planning for Phase IV, this time it was proposed to run between Dwarka – Prem Piao with the rest of the corridor to Narela transferred over to an extension of the Red Line. The Red Line extension to Narela was approved for Phase IV but the remaining section between Dwarka – Prem Piao was subsequently dropped from Phase IV. Rithala to Narela portion has been approved and included in the phase-IV. An extension of Red Line. In June 2017, the Government of Haryana's cabinet approved the investment of INR 968.20 crore (US$150 million), as its share on the 80:20 equity ratio with the union Government, for the 4.86 kilometres (3.02 mi) extension of Delhi Metro from the existing Rithala metro station to Sonipat via Bawana with three elevated stations at Sector 5 of Narela in Delhi, on Delhi border at Kundli Industrial Area and Nathupur Industrial Area in Sonipat, which are planned to be built as part of Phase IV. Gurugram to Faridabad - approved with expected completion by December 2021: On 13 December 2018, the INR5,900 crore project with 7 stations from Bata Chowk with Badkal Enclave, Pali Crusher Zone, Bhati Mines, Mandi, Sushant Sector 54, Sector 45 and Huda City Center was granted in-principal approval by the Union Ministry of Housing and Urban Affairs, the DPR for which will be completed by June 2019. HUDA City Centre to Gurgaon railway station - approved 12 kilometres (7.5 mi) long line that is envisioned to be a metro ring around Gurugram. The proposal was prepared in November 2017 for the two routes: one is Yellow Line extension from HUDA City Centre to Gurgaon railway station and another from IFFCO Chowk – Dwarka Sector 21 ultimately the government decided to move forward with the line to Gurgaon railway station and pushed the latter to a later implementation date. HUDA City Centre to Manesar City - approved: An extension of Yellow Line, included in the Gurugram Masterplan 2031, approved by the Haryana govt will go up to Panchgaon Chowk in Manesar, where it will interchange withDelhi–Alwar Regional Rapid Transit System, Western Peripheral Expressway's Multimodal Transit Centre and Jhajjar-Palwal rail line. City Park – Rohtak City: A Green Line extension. As of July 2017, proposed only and not yet approved. Ballabhgarh – Palwal City - Jewar International Airport: An extension of Violet Line. As of July 2017, proposed only and not yet approved. Dhansa Bus Stand – Jhajjar City: A Grey Line extension, proposed only and not yet approved. Old Gurgaon – Old Faridabad via HUDA City Centre - Greater Noida Not yet approved. A Pink Line extension. Proposed only, not approved. Noida Electronic City – Sahibabad: 5.11 kilometres (3.18 mi) long Blue Line extension. Noida – Noida International Airport: a 35 kilometres (22 mi) long surface running line along the Yamuna Expressway serving the proposed new Noida International Airport. The line is envisioned to be completed by 2025 and will connect with the Noida Metro. Delhi Metro currently has 15 operational depots. Of note, Delhi Metro has been operating with a loss on an EBT basis for the past few years, though the loss has reduced after 2015-16. EBITDA margin declined from 73% in Fiscal 2007 to 27% in Fiscal 2016-17 before improving to 30% in 2017-18. DMRC is owned equally by the Government of National Capital Territory of Delhi and the Government of India. As of March 2016, total debt stood at ₹291.5 billion (US$4.1 billion), while equity capital was ₹239.9 billion (US$3.3 billion). Cost of the debt is 0% for Union Government and Delhi Government loans and between 0.01% and 2.3% for Japan International Cooperation Agency (JICA) loans. Of the equity capital as of 31 March 2016, ₹193.1 billion (US$2.7 billion) is paid-up capital and rest is reserves and surplus. Inside the New Delhi Metro station. The trains operate at a frequency of one to two minutes to five to ten minutes between 05:00 and 00:00, depending upon the peak and off-peak hours. Trains operating within the network typically travel at speed up to 75 km/h (47 mph) and stop for about 20 seconds at each station. Automated station announcements are recorded in Hindi and English. Many stations have services such as ATMs, food outlets, cafés, convenience stores and mobile recharge. Eating, drinking, smoking and chewing gum are prohibited in the entire system. The Metro also has a sophisticated fire alarm system for advance warning in emergencies, and fire retardant material is used in trains as well as on the premises of stations. Navigation information is available on Google Maps. Since October 2010, the first coach of every train is reserved for women. However, last coaches are also reserved when the train changes tracks at the terminal stations in the Red, Green and Violet Lines. To make travelling by metro a smoother experience, Delhi Metro has launched its own official mobile app Delhi Metro Rail for smartphone users,(iPhone and Android) that will provide information on various facilities like the location of the nearest metro station, fare, parking availability, tourist spots near metro stations, security and emergency helpline numbers. Security on the Delhi Metro is handled by the Central Industrial Security Force (CISF), who have been guarding the system ever since they took over from the Delhi Police in 2007. Closed-circuit cameras are used to monitor trains and stations, and feed from these is monitored by both the CISF and Delhi Metro authorities at their respective control rooms. Over 7000 CISF personnel have been deployed for security of metro and its installations in addition to metal detectors, X-ray baggage inspection systems, and dog squads which are used to secure the system. To deal with law and order issues in the system, 18 Delhi Metro Rail Police (A dedicated wing of Delhi Police) stations have been established. About 5,200 CCTV cameras have been installed, which cover every nook and corner of each Metro station. Each of the underground stations has about 45 to 50 cameras installed while the elevated stations have about 16 to 20 cameras each. The monitoring of these cameras is done by the CISF, which is in charge of security of the Metro, as well as the Delhi Metro Rail Corporation. Intercoms are provided in each train car for emergency communication between the passengers and the train operator. Periodic security drills are carried out at stations and on trains to ensure preparedness of security agencies in emergency situations. DMRC is also looking at raising the station walls and railings for the safety of passengers. For the convenience of customers, Delhi Metro commuters have three choices for ticket purchase. The RFID tokens are valid only for a single journey on the day of purchase and the value depends on the distance travelled, with fares for a single journey ranging from ₹10 (14¢ US) to ₹60 (83¢ US). Fares have been revised by DMRC and will be applicable from 10 October 2017. Fares are calculated based on the origin and destination stations using a fare chart. A common ticketing facility for commuters travelling on Delhi Transport Corporation (DTC) buses and the Metro was introduced in 2011. Travel cards are available for longer durations and are most convenient for frequent commuters. They are valid for ten years from the date of purchase or the date of the last recharge and are available in denominations of ₹200 (US$2.80) to ₹2,000 (US$27.80). A 10% discount is given on all travel made on it.An additional 10% discount is given to travel card holders for entering the metro system in off-peak hours i.e. From the start of revenue services to 0800 hours, from 1200 hours to 1700 hours and after 2100 hours to end of metro service in the night. This additional discount is given only on Weekdays i.e. from Monday to Saturday. A deposit of ₹50 (70¢ US) needs to be made to buy a new card which is refundable on the return of the card any time before its expiry if the card is not physically damaged. Tourist cards can be used for unlimited travel on the Delhi Metro network over short periods of time. There are two kinds of tourist cards valid for one and three days respectively. The cost of a one-day card is ₹200 (US$2.80) and that of a three-day card is ₹500 (US$7.00), including a refundable deposit of ₹50 (70¢ US) that must be paid at the time of purchasing the card. The Yellow Line at IFFCO Chowk in Gurgaon. After repeated complaints by nearby residents, Delhi Metro installed noise barriers in 2011 to reduce sound pollution from metro trains. As the network has expanded, high ridership in new trains has led to increasing instances of overcrowding and delays on the Delhi Metro. To alleviate the problem, 8 coach trains have been introduced in Yellow line and Blue line and an increase in the frequency of trains has been proposed. Infrequent, overcrowded and erratic feeder bus services connecting stations to nearby localities have also been reported as an area of concern. While the quality and the cleanliness of the Delhi Metro was lauded, the rising cost of fares have been routinely criticized, with fares being much more expensive compared to the bus services the metro replaced. One recent study has named the fares of the Delhi Metro as one of the world's most unaffordable. Another study finds that Delhi Metro may also have a low ridership problem compared to its size and may not be generating the amount of traffic a metro system generates. DMRC operates around 291 feeder buses on 42 routes connecting 54 metro stations in Delhi. Around two lakh people use the feeder bus service on a daily basis.Timings of Feeder Bus operation are 08:00 Hours to 20:00 Hours at a frequency of 10 to 15 minutes depending upon Road Traffic density. However, if an operator wishes he can operate before/beyond these hours. At present Metro Feeder Bus Depots are located at Shastri Park, Kohat Enclave, Janakpuri West, Dwarka Sector-9, Chhatarpur, Yamuna Bank, Azadpur. Delhi Metro has been registering a continuous increase in ridership since its inception. When Metro services were introduced in 2002, the average ridership was 80,000 passengers per day. As of FY 2016–17, average daily ridership has risen to 2.76 million, with the latest daily ridership record set on 17 August 2016. Most recent Delhi Metro daily ridership record of 3.3 million passengers was reached on the eve of the Rakshabandhan (17 August 2016), when commuters poured in large numbers throughout the day. On 25 December 2014, it was reported that the monthly ridership of the Airport Express had almost doubled in the past year to almost 600,000 passengers per month compared to just above 300,000 at the beginning of the calendar year. Currently, Delhi Metro has about 220 trains of four, six and eight coaches totalling 1,290 coaches. It is further planning to add 421 more coaches on the existing route before the completion of phase 3. During the financial year 2015, DMRC on an average pressed 1,083 coaches in an hour (during peak hour), in 2012–13, the number was 819. On an average, trains make 2,880 trips per day. The annual report 2017-2018 has however for the first time mentioned a decline in the avg. ridership since the inception by 8.08% from the year 2017-2018. A Phase I broad gauge train, supplied by Mitsubishi Corporation–BEML. The Metro uses rolling stock of two different gauges. Phase I lines use 1,676 mm (5.499 ft) broad gauge rolling stock, while three Phase II lines use 1,435 mm (4.708 ft) standard gauge rolling stock. Trains are maintained at seven depots at Khyber Pass and Sultanpur for the Yellow Line, Mundka for the Green Line, Najafgarh and Yamuna Bank for the Blue Line, Shastri Park for the Red Line, and Sarita Vihar for the Violet Line. Maglev trains were initially considered for some lines of Phase 3, but DMRC decided to continue with conventional rail in August 2012. As on 31 March 2015, the Company has a total of 1306 coaches (220 trains). Apart from extensions on various existing lines, two new lines viz. Line 7 & 8 are proposed in Phase III. 486 coaches (81 six-car trains) being procured for these two new lines will have an advance feature in Unattended Train Operation (UTO). Additional 258 Broad gauge (BG) coaches for Line 1 to 4 and 138 Standard Gauge (SG) coaches for Line 5 & 6 are proposed to be procured for augmentation/extensions to cater to the increased traffic. Resultantly, at the end of Phase III, there would be 2188 coaches (333 trains). Barring a few 4-car trains on Line 5, 93% of the trains would operate either in 6 car or 8 car configuration at the end of Phase III. The rolling stock is manufactured by two major suppliers. For the Phase I, the rolling stock was supplied by a consortium of companies comprising Hyundai Rotem, Mitsubishi Corporation, and MELCO. The coaches have a very similar look to MTR Rotem EMU, except with only 4 doors and use sliding doors. The coaches were initially built in South Korea by ROTEM, then in Bangalore by BEML through a technology transfer arrangement. These trains consist of four 3.2-metre-wide (10 ft) stainless steel lightweight coaches with vestibules permitting movement throughout their length and can carry up to 1500 passengers, with 50 seated and 330 standing passengers per coach. The coaches are fully air-conditioned, equipped with automatic doors, microprocessor-controlled brakes and secondary air suspension, and are capable of maintaining an average speed of 32 km/h (20 mph) over a distance of 1.1 km (0.68 mi). The system is extensible up to eight coaches, and platforms have been designed accordingly. The rolling stock for Phase II is being supplied by Bombardier Transportation, which has received an order for 614 cars worth approximately US$1.1 billion. While initial trains were made in Görlitz, Germany and Sweden, the remainder will be built at Bombardier's factory in Savli, near Vadodara. These trains are a mix of four-car and six-car consists, capable of accommodating 1178 and 1792 commuters per train respectively. The coaches possess several improved features like Closed Circuit Television (CCTV) cameras with eight-hour backup for added security, charging points in all coaches for cell phones and laptops, improved air conditioning to provide a temperature of 25 °C (77 °F) even in packed conditions and heaters for winter. The standard gauge rolling stock is manufactured by BEML at its factory in Bangalore (Most of these trains are supplied to BEML by Hyundai Rotem). The trains are four-car consists with a capacity of 1506 commuters per train, accommodating 50 seated and 292 standing passengers in each coach. These trains will have CCTV cameras in and outside the coaches, power supply connections inside coaches to charge mobiles and laptops, better humidity control, microprocessor-controlled disc brakes, and will be capable of maintaining an average speed of 34 km/h (21 mph) over a distance of 1.1 km (0.68 mi). Eight 6-car trains supplied by CAF Beasain were imported from Spain. CAF held 5% equity in the DAME project, and Reliance Infrastructure held the remaining 95% before DMRC took over the operations. The trains on this line are of a premium standard compared to the existing metro trains and have inbuilt noise reduction and padded fabric seats. The coaches are equipped with LCD screens for the entertainment of the passengers and also provide flight information for the convenience of air travellers. The trains are fitted with an event recorder which can withstand high levels of temperature and impact and the wheels have flange lubrication system for less noise and better riding comfort. Inside a Mitsubishi Corporation coach. The Delhi Metro uses cab signalling along with a centralised automatic train control system consisting of automatic operation, protection and signalling modules. A 380 MHz digital trunked TETRA radio communication system from Motorola is used on all lines to carry both voice and data information. For Blue Line Siemens Transportation Systems has supplied the electronic interlocking Sicas, the operation control system Vicos OC 500 and the automation control system LZB 700 M. An integrated system comprising optical fibre cable, on-train radio, CCTV, and a centralised clock and public address system is used for telecommunication during train operations as well as emergencies. For Red and Yellow lines ALSTOM has supplied signalling system and for Green and Violet lines, Bombardier Transportation has supplied CITYFLO 350 signalling system. 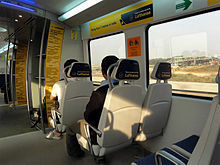 The Airport Express line has introduced WiFi services at all stations along the route on 13 January 2012. Connectivity inside metro trains travelling on the route is expected in the future. The WiFi service is provided by YOU Broadband and Cable India Limited. In August 2017, Wifi service was launched at all the 50 stations under Blue Line. A fully automated, operator-less train system has been offered to Delhi Metro by the French defence and civilian technologies major Thales. The Delhi Metro has won awards for environmentally friendly practices from organisations including the United Nations, RINA, and the International Organization for Standardization, becoming the second metro in the world, after the New York City Subway, to be ISO 14001 certified for environmentally friendly construction. Most of the Metro stations on the Blue Line conduct rainwater harvesting as an environmental protection measure. It is also the first railway project in the world to earn carbon credits after being registered with the United Nations under the Clean Development Mechanism, and has so far earned 400,000 carbon credits by saving energy through the use of regenerative braking systems on its trains. To reduce its dependence on non-renewable sources of energy, DMRC is looking forward to harnessing solar energy and install solar panels at the Karkardooma, Noida Sector-21, Anand Vihar and Pragati Maidan Metro stations and DMRC's residential complex at Pushp Vihar. As of March 2017, the DMRC has commissioned 20 MWp (megawatt peak) of solar power plants across 21 locations on the metro network. This is planned to increase to 31 MWp by March 2018, and 50 MWp by 2021. The Metro has been promoted as an integral part of community infrastructure, and community artwork depicting the local way of life has been put on display at stations. Students of local art colleges have also designed decorative murals at Metro stations, while pillars of the viaduct on some elevated sections have been decorated with mosaic murals created by local schoolchildren. The Metro station at INA Colony has a gallery showcasing artwork and handicrafts from across India, while all stations on the Central Secretariat – Qutub Minar section of the Yellow Line have panels installed on the monumental architectural heritage of Delhi. The Nobel Memorial Wall at Rajiv Chowk has portraits of the seven Nobel Laureates from India: Rabindranath Tagore, CV Raman, Hargobind Khorana, Mother Teresa, Subrahmanyan Chandrasekhar, Amartya Sen and Venkatraman Ramakrishnan and provide details about their contribution to society and a panel each on Alfred Nobel and the Nobel Prizes. Delhi Metro Rail Corporation won the Golden Peacock Environment Management Award 2005. Delhi Metro Rail Corporation became the first Indian company to bag the World Green Building Council award for demonstrating “Industry Leadership in Sustainability”. Delhi Metro Rail Corporation won the PSU of the year Award by All India Management Association (AIMA), 2016. Delhi Metro Rail Corporation won the Japan International Cooperation Agency (JICA) President’s Award 2012. ^ a b "Delhi Metro's Ghaziabad, Noida extension sections thrown open to public". The Times of India. New Delhi: The Times of India. 9 March 2019. Retrieved 20 March 2019. ^ a b c "Route Map". DMRC. Retrieved 23 March 2019. ^ a b c "Present Network". Delhi Metro Rail Corporation Ltd. Retrieved 8 March 2019. ^ a b "ANNUAL REPORT 2017-2018" (PDF). DMRC. ^ "Mangu Singh to be next Metro chief". The Times of India. 20 October 2011. ^ a b c d "About Us – Introduction". Delhi Metro Rail Corporation. Archived from the original on 3 October 2017. Retrieved 16 January 2018. ^ Dua, Tanya (24 November 2018). "After 5 years of riding the New York City subway, I tried the Delhi Metro at the busiest time of the year - and it showed me exactly what I'm missing". Business Insider. Retrieved 24 February 2019. ^ a b "DMRC to join global club of metro networks having span of over 300 km". ^ "First and Last Train Timings" (PDF). delhimetrorail.com. Archived from the original (PDF) on 12 July 2017. Retrieved 16 June 2017. ^ Roy, Sidharatha (25 December 2017). "Delhi Metro: It all started 15 Xmas days ago". The Times of India. New Delhi. Archived from the original on 7 January 2018. Retrieved 16 January 2018. ^ "PM Innaugrates metro link to Ballabhgarh". ^ Majumder, Arindam (4 February 2019). "Delhi Metro decides to take over the operations of Gurgaon Rapid Metro". Business Standard India. Retrieved 4 February 2019. ^ "DMRC set to run Rapid Metro from February, its second rescue act of a private line - Times of India". The Times of India. Retrieved 4 February 2019. ^ a b "History of Delhi Metro". DMRC. Archived from the original on 25 September 2010. Retrieved 17 September 2009. ^ Pucher, John; Nisha Korattyswaroopam,; Neenu Ittyerah (2004). "The Crisis of Public Transport in India" (PDF). Journal of Public Transportation. 7 (4): 1–20. Archived from the original (pdf) on 3 July 2011. Retrieved 17 September 2009. ^ "Structure of Delhi Metro". DMRC. Archived from the original on 16 September 2010. Retrieved 17 September 2009. ^ "Delhi metro rail work begins but without fanfare". The Indian Express. Archived from the original on 18 April 2008. ^ "Delhi Metro showcases public sector success". The Indian Express. 13 April 2007. Archived from the original on 25 December 2008. Retrieved 10 September 2009. ^ "二零零一度" (PDF). MTR Corporation. Retrieved 3 August 2017. ^ "Delhi Metro Rail to adopt BG system". Business Line. New Delhi: The Hindu. 7 August 2000. Archived from the original on 1 February 2016. Retrieved 16 January 2018. ^ "Indian PM launches Delhi metro". BBC News. 24 December 2002. Archived from the original on 22 April 2012. Retrieved 22 April 2010. ^ "The Tribune, Chandigarh, India – Delhi and neighbourhood". tribuneindia.com. Archived from the original on 12 March 2016. Retrieved 12 February 2017. ^ "The Tribune – Magazine section – Saturday Extra". tribuneindia.com. Archived from the original on 16 July 2007. Retrieved 12 February 2017. ^ Nandini Lakshman (19 March 2007). "The Miracle-Worker of the Delhi Metro". BusinessWeek. Archived from the original on 25 December 2008. Retrieved 10 September 2009. ^ "Delhi Metro bridge collapses; 1 dead". IBN Live. CNN-IBN. 19 October 2008. Retrieved 19 October 2008. ^ "A chronology of Delhi Metro accidents". Hindustan Times. 12 July 2009. Archived from the original on 7 January 2018. Retrieved 22 January 2018. ^ Suri, Megha (14 July 2009). "Day 2: 3 cranes fall, Metro image takes beating". The Times of India. New Delhi. Archived from the original on 27 June 2014. Retrieved 22 January 2018. ^ "Labourer dies at Delhi Metro construction site". Central Chronicle. 22 July 2009. Archived from the original on 8 July 2011. Retrieved 22 April 2010. ^ Mathur, Atul (7 December 2009). "City's nightmare on wheels". Hindustan Times. Delhi. Archived from the original on 22 January 2018. Retrieved 22 January 2018. ^ "Five injured as iron girder falls off Metro structure in Ghaziabad". Hindustan Times. Delhi. 23 April 2018. Archived from the original on 23 April 2018. ^ a b "PROJECT UPDATE". Delhi Metro Rail Corporation. Archived from the original on 23 February 2014. Retrieved 2 March 2014. ^ Ramachandran, Smriti Kak (17 September 2007). "Delhi Metro confident of meeting deadline". The Hindu. New Delhi. Archived from the original on 3 March 2018. Retrieved 10 September 2009. ^ a b "Route Map". Delhi Metro Rail Corporation Ltd. Retrieved 23 September 2018. ^ "Metro Station Numbers". Delhi Metro Rail Corporation. Archived from the original on 13 February 2014. Retrieved 22 January 2018. ^ "Delhi Metro rings in the New Year under new chief". Jagran Post. New Delhi: Dainik Jagran. 1 January 2012. Archived from the original on 2 July 2017. Retrieved 16 January 2018. ^ a b "Metro to cover whole of Delhi by 2012". Economic Times. 11 December 2011. Retrieved 8 April 2012. ^ "Jung wants better access to all Metro stations". The Indian Express. 23 April 2014. Archived from the original on 24 April 2014. Retrieved 24 April 2014. ^ "Phase 3 Corridors" (Press release). DMRC. Archived from the original on 6 June 2017. Retrieved 4 June 2017. ^ "Tunnelling work starts for Metro's Phase III". Economic Times. 31 January 2012. Retrieved 8 April 2012. ^ a b Will not let funding row derail Phase-IV: Government Archived 7 July 2017 at the Wayback Machine, The Economic Times, 4 July 2017. ^ Ray, Amrita, ed. (25 December 2017). "Delhi Metro Inauguration Live Updates: Botanical Garden-Kalkaji Mandir Section Thrown Open To Public". NDTV. New Delhi. Archived from the original on 30 December 2017. Retrieved 16 January 2018. ^ "Metro to introduce advanced signalling system in Phase-III". Economic Times. 15 December 2011. Retrieved 8 April 2012. ^ "SHAHEED STHAL (NEW BUS ADDA) TO DILSHAD GARDEN METRO SECTION FLAGGED OFF". delhimetrorail.com. Retrieved 17 March 2019. ^ Shah, Narendra (10 November 2018). "Delhi Metro | Delhi Metro Phase 4 commissioning in 2025". Metro Rail News. Retrieved 24 January 2019. ^ Delhi Metro Phase-4 gets government nod Archived 9 July 2017 at the Wayback Machine, The Times of India, 6 January 2017. ^ Gaurav Vivek Bhatnagar (25 December 2006). "Delhi Metro map to cover Greater Noida". The Hindu. Archived from the original on 1 June 2009. Retrieved 10 September 2009. ^ Megha Suri (30 January 2010). "Pvt metro link to get Central nod soon". The Times of India. Retrieved 2 February 2010. ^ Delhi Metro: DMRC to come up with elevated road network below these 3 new lines, FInancial Express, 21 December 2018. ^ "Delhi Metro Red Line". Archived from the original on 5 October 2016. Retrieved 20 September 2016. ^ a b "On May 2, Metro to cross Yamuna again". The Times of India. New Delhi. 24 April 2009. Archived from the original on 3 February 2015. Retrieved 16 January 2018. ^ "Prime Minister inaugurates Metro Rail services between Tis Hazari and Shahdara" (Press release). Press Information Bureau, Government of India. 24 December 2002. Archived from the original on 21 July 2011. Retrieved 29 March 2010. ^ "Passengers swamp Delhi's new metro". Sydney Morning Herald. 27 December 2002. Archived from the original on 16 January 2018. Retrieved 16 January 2018. ^ "70,000 travel by Tri Nagar-Tis Hazari Metro rail". The Times of India. New Delhi. 5 October 2003. Archived from the original on 16 January 2018. Retrieved 16 January 2018. ^ a b c "Metro Station Information". DMRC. Archived from the original on 18 September 2010. Retrieved 29 March 2009. ^ "DMRC to introduce six-coach trains on Dilshad Garden-Rithala line on Sunday". The Times of India. New Delhi. 23 November 2013. Archived from the original on 4 February 2015. Retrieved 16 January 2018. ^ "A subterranean journey begins". The Times of India. New Delhi. 20 December 2004. Archived from the original on 3 March 2018. Retrieved 22 January 2018. ^ a b "Delhi Metro Museum Celebrates 3rd Anniversary". RailNews Media India Ltd. Archived from the original on 11 September 2014. ^ "Hauz Khas set to get deepest underground metro station by March 2016". The Indian Express. New Delhi. 16 September 2014. Archived from the original on 16 January 2018. Retrieved 22 January 2018. ^ "Chhattarpur Metro Station To Become Operational From Tomorrow" (Press release). New Delhi: Delhi Metro Rail Corporation. 25 August 2010. Archived from the original on 7 November 2017. Retrieved 22 January 2018. ^ "Chattarpur station to open today". The Times of India. New Delhi. 26 August 2010. Archived from the original on 3 March 2018. Retrieved 22 January 2018. ^ "Gurgaon gets a lifeline as CST-Qutub corridor opens". Sify News. New Delhi. 8 September 2010. Archived from the original on 16 November 2017. Retrieved 22 January 2018. ^ "The Jahangirpuri- Samaypur Badli section (Extension of Line-2)". Delhi Metro. Archived from the original on 13 November 2015. Retrieved 9 November 2015. ^ Sharma, Nidhi (29 June 2005). "New Delhi Metro station, your connect with National rail". The Times of India. New Delhi. Archived from the original on 22 January 2018. Retrieved 22 January 2018. ^ "Secretariat to DU in 18 minutes flat". The Hindu. New Delhi. 1 July 2005. Archived from the original on 1 February 2016. Retrieved 22 January 2018. ^ a b "Metro enters Noida, set to change travelling habits of people". Daily News and Analysis. 12 November 2009. Archived from the original on 31 May 2012. Retrieved 12 January 2009. ^ a b "Metro to travel underground and overhead". The Times of India. 28 December 2005. Archived from the original on 26 January 2013. Retrieved 4 April 2010. ^ Gaurav Vivek Bhatnagar (12 November 2006). "Delhi Metro just got bigger and better". The Hindu. Archived from the original on 29 June 2011. Retrieved 4 April 2010. ^ "Delhi Anand Vihar Metro line opens for public". The Economic Times. 7 January 2010. Archived from the original on 10 January 2010. Retrieved 8 January 2010. ^ "Anand Vihar – Vaishali Section To Open For Passenger Services From 14th July 2011" (Press release). DMRC. 13 July 2011. Archived from the original on 27 July 2011. ^ "Press Release: DMRC Extends Metro Services To Dwarka Sector 21 on Line-3" (Press release). DMRC. 30 October 2010. Archived from the original on 23 November 2010. Retrieved 30 October 2010. ^ "PM Modi flags off Noida City Centre-Noida Electronic City section of Delhi Metro 's Blue Line | Business News". timesnownews.com. Retrieved 20 March 2019. ^ "40000 Footfalls at Anand Vihar Metro on Day 1". Outlook India. 7 January 2010. Archived from the original on 17 January 2010. Retrieved 4 April 2010. ^ "Metro gets first standard gauge depot". The Hindu. New Delhi. 23 February 2010. Retrieved 16 January 2018. ^ a b "Metro from Central Secretariat to Sarita Vihar too". Yahoo! News. New Delhi. 3 October 2010. Archived from the original on 16 January 2018. Retrieved 16 January 2018. ^ Suri, Megha (16 October 2010). "Train services on Delhi Metro's Central Secretariat to Sarita Vihar section will start one hour late (from 7 am) from October 17 to October 24 for integration of the section with the extension to Badarpur". The Times of India. Archived from the original on 16 January 2018. Retrieved 16 January 2018. ^ "DMRC opens Sarita Vihar–Badarpur section". Hindustan Times. 14 January 2011. Archived from the original on 20 October 2012. Retrieved 14 January 2011. ^ "Janpath to Faridabad: On Sunday morning, a Metro ride for PM Modi". Hindustan Times. PTI. 6 September 2015. Archived from the original on 6 September 2015. Retrieved 6 September 2015. ^ "Faridabad Metro Stations get highest Green Building Rating". delhimetrorail.com. Archived from the original on 8 December 2015. ^ Ray, Subhendu (23 January 2012). "NCR's longest Metro line in Faridabad". Hindustan Times. Delhi. Archived from the original on 3 March 2018. Retrieved 16 January 2018. ^ "Delhi: Kashmere Gate set to become biggest interchange station". The Indian Express. New Delhi. 26 May 2017. Archived from the original on 25 August 2017. Retrieved 15 January 2018. ^ Singh, Megha Suri (17 August 2010). "Hawk-eyed vigil on airport metro line". The Times of India. New Delhi. Archived from the original on 16 January 2018. Retrieved 16 January 2018. ^ "Delhi Airport Express rail link opens". Railway Gazette International. Retrieved 7 July 2012. ^ a b "Airport Express Link: Metro gives a preview". The Indian Express. New Delhi. 6 November 2009. Archived from the original on 1 February 2016. Retrieved 16 January 2018. ^ "Airport Metro misses CWG deadline". NDTV. 3 October 2010. Archived from the original on 6 October 2010. Retrieved 9 November 2010. ^ "Cities / Delhi : Airport to be 20 minutes from Connaught Place from Wednesday". The Hindu. 21 February 2011. Archived from the original on 28 September 2011. Retrieved 24 October 2011. ^ "Delhi Airport Metro Express back on track". Livemint. New Delhi: HT Media Ltd. 22 January 2013. Archived from the original on 17 January 2018. Retrieved 16 January 2018. ^ "Delhi Metro takes over operations of Airport Express Line". The Hindu. 1 July 2013. Archived from the original on 4 July 2013. Retrieved 5 July 2013. ^ "Airport Metro sees 30% rise in ridership after fare reduction". Business Standard. 1 January 2015. Archived from the original on 7 January 2015. Retrieved 19 January 2015. ^ "DMRC to reduce Airport line fares". The Times of India. 15 September 2015. Archived from the original on 18 September 2015. Retrieved 15 September 2015. ^ "New high for Metro with track at 24m". The Indian Express. 26 September 2014. ^ "Delhi Metro to come up with eight new corridors in Phase IV". India Today. Retrieved 4 August 2018. ^ "Govt proposes 6 new Metro routes - Times of India". The Times of India. Retrieved 4 August 2018. ^ "DMRC MD Approves Survey for Modified 95.86 km Phase 4 - The Metro Rail Guy". themetrorailguy.com. Retrieved 4 August 2018. ^ "Delhi Metro to be extended till Sonepat in Haryana". Zee News. 1 June 2017. Retrieved 4 August 2018. ^ Gurugram to Faridabad metro from 2021, The tribune, 25 December 2018. ^ Gurugram Faridabad Metro link, The Tirbune, 27 December 2018. ^ a b "Govt changes its mind again, no Dwarka-Gurugram Metro in near future - Times of India". The Times of India. Retrieved 4 August 2018. ^ "Now, Khattar says Dwarka-Iffco Metro line in 'extreme final stage' - Times of India". The Times of India. Retrieved 4 August 2018. ^ Kumar, Ashok (4 May 2017). "Metro to connect HUDA City Centre station with Gurugram railway station". The Hindu. ISSN 0971-751X. Retrieved 6 August 2018. ^ "TCP department realigns metro route linking Gurgaon to Manesar - Times of India". The Times of India. Retrieved 4 August 2018. ^ a b c Expected PM Narendra Modi to announce Metro's extension to other parts of Haryana, says CM Bhupinder Hooda Archived 26 October 2016 at the Wayback Machine, DNA India News, September 2015. ^ Route alignment of Manesar metro changed, TImes of India, Nov 2018. ^ "Haryana CM announces extension of Delhi Metro upto Jhajjar town – RailNews Media India Ltd". railnews.in. Retrieved 6 August 2018. ^ a b "DMRC submits plan to extend metro from Noida to Ghaziabad - Times of India". The Times of India. Retrieved 4 August 2018. ^ "GDA Approves Extn of Delhi's Blue Line from Vaishali to Mohan Nagar - The Metro Rail Guy". themetrorailguy.com. Retrieved 4 August 2018. ^ "Metro to run deeper into Noida, Ghaziabad by September - Times of India". The Times of India. Retrieved 4 August 2018. ^ YEIDA revives proposal for Greater Noida-Jewar airport Metro Archived 9 May 2017 at the Wayback Machine, The Economic Times, 25 April 2017. ^ "Delhi-Jewar international airport to be connected via metro! Check details". Times Now. Retrieved 23 February 2019. ^ "Annual Reports - 2006-07" (PDF). Delhi Metro Rail Corporation. Archived (PDF) from the original on 21 September 2017. Retrieved 22 January 2018. ^ "Annual Reports - 2007-08" (PDF). Delhi Metro Rail Corporation. Archived (PDF) from the original on 21 September 2017. Retrieved 22 January 2018. ^ "Annual Reports - 2008-09" (PDF). Delhi Metro Rail Corporation. Archived (PDF) from the original on 21 September 2017. Retrieved 22 January 2018. ^ "Annual Reports - 2009-10" (PDF). Delhi Metro Rail Corporation. Archived (PDF) from the original on 21 September 2017. Retrieved 22 January 2018. ^ "Annual Reports - 2010-11" (PDF). Delhi Metro Rail Corporation. Archived (PDF) from the original on 21 September 2017. Retrieved 22 January 2018. ^ "Annual Reports - 2011-12" (PDF). Delhi Metro Rail Corporation. Archived (PDF) from the original on 10 January 2017. Retrieved 22 January 2018. ^ "Annual Reports - 2012-13" (PDF). Delhi Metro Rail Corporation. Archived (PDF) from the original on 4 March 2016. Retrieved 22 January 2018. ^ "Annual Reports - 2013-14" (PDF). Delhi Metro Rail Corporation. Archived (PDF) from the original on 16 December 2017. Retrieved 22 January 2018. ^ "Annual Reports 2014-15" (PDF). Delhi Metro Rail Corporation. Archived (PDF) from the original on 4 March 2016. Retrieved 20 January 2018. ^ a b "Annual Reports 2015-16" (PDF). Delhi Metro Rail Corporation. Archived (PDF) from the original on 23 January 2018. Retrieved 22 January 2018. ^ Singh, Sudheer Pal (31 May 2016). "Delhi Metro Rail finances in the red". Business Standard. New Delhi. Archived from the original on 30 September 2017. Retrieved 22 January 2018. ^ "Annual Accounts And Directors Report 2016-17" (PDF). Delhi Metro Rail Corporation. Archived (PDF) from the original on 3 December 2017. Retrieved 22 January 2018. ^ a b "Annual Accounts And Directors Report 2017-18" (PDF). Delhi Metro Rail Corporation. Retrieved 28 January 2019. ^ "Measures to Ensure Safe Passage for Metro Train Passengers" (Press release). Press Information Bureau, Government of India. 27 August 2010. Archived from the original on 15 July 2015. Retrieved 27 August 2010. ^ "Delhi Metro routes now on Google Maps". The Economic Times. 5 March 2010. Archived from the original on 7 March 2010. Retrieved 11 March 2010. ^ a b "Delhi Metro to reserve coach for women from October 2". The Times of India. 26 September 2010. Archived from the original on 28 September 2010. Retrieved 27 September 2010. ^ "Women get exclusive coach in Delhi Metro". Hindustan Times. 2 October 2010. Archived from the original on 16 December 2014. Retrieved 2 October 2010. ^ "Delhi Metro launches new app with additional features". ^ "DMRC launches smart phone app". The Hindu. New Delhi. 23 August 2013. Archived from the original on 1 February 2016. Retrieved 16 January 2018. ^ "CISF to take over Delhi Metro security". The Times of India. 7 March 2007. Retrieved 15 April 2010. ^ "Delhi metro parking areas to be bought under CCTV cameras". Daily News and Analysis. 21 March 2010. Archived from the original on 26 August 2010. Retrieved 15 April 2010. ^ Megha Suri Singh (30 March 2010). "Moscow blasts put Metro security in alert mode". The Times of India. Retrieved 15 April 2010. ^ "Commuters Guide to Security on Delhi Metro" (pdf). DMRC. Archived (PDF) from the original on 20 September 2010. Retrieved 15 April 2010. ^ "Mock drills at 4 Metro stations". The Times of India. 26 March 2010. Retrieved 15 April 2010. ^ "Metro to raise height of walls at stations". The Times of India. 9 May 2012. Retrieved 9 May 2012. ^ a b c "Route & fare". DMRC. Archived from the original on 17 September 2010. Retrieved 22 September 2010. ^ "Common tickets for DTC, Metro by 2011". Sify News. 26 March 2010. Archived from the original on 2 April 2010. ^ "10 % Discount on Metro SMART CARDS". DMRC. Archived from the original on 6 June 2007. ^ "Noise barriers not enough, residents want speed of Metro trains to be slowed". Hindustan Times. 2011. Retrieved 14 July 2018. ^ a b Dutta, Sweta (16 November 2009). "Widening reach, Metro looks at ways to ease rush". The Indian Express. New Delhi. Archived from the original on 28 June 2017. Retrieved 15 January 2018. ^ Atul Mathur (19 November 2009). "Crowded stations, slow trains". Hindustan Times. Archived from the original on 22 November 2009. Retrieved 21 November 2009. ^ Atul Mathur (8 December 2009). "Feeder service or the lack of it". Hindustan Times. Archived from the original on 11 July 2011. Retrieved 8 December 2009. ^ "Parking, feeder bus woes on Metros Noida line". Retrieved 12 February 2017. ^ "Delhi Metro is second-most unaffordable in world: CSE - Times of India". The Times of India. Retrieved 6 September 2018. ^ Roy, Shubho; Shah, Ajay (December 2018). "Concerns with Delhi Metro". The Leap Blog. Retrieved 21 January 2019. ^ Singh, Pragya (25 December 2014). "100 per cent rise in Airport Metro Line ridership". The Asian Age. Archived from the original on 25 December 2014. Retrieved 25 December 2014. ^ Haidar, Faizan (7 October 2015). "Delhi Metro: Steep rise in ridership beats network expansion". Hindustan Times. Archived from the original on 26 August 2017. Retrieved 15 January 2018. ^ "Delhi Metro's Cumulative Ridership for the financial year 2016-2017 crosses one billion (100 crores)" (pdf). DMRC. Archived from the original on 16 April 2017. Retrieved 25 February 2015. ^ Reuters – Hyundai Rotem gets m order to supply trains. In.reuters.com. Retrieved on 24 October 2011. ^ "Delhi Metro gets standard gauge train". Business Line. New Delhi: The Hindu. 18 March 2009. Archived from the original on 11 August 2011. Retrieved 22 January 2018. ^ "Metro gets first standard gauge depot". The Hindu. New Delhi. 23 February 2010. Retrieved 22 January 2018. ^ a b "Delhi Metro, India". Railway-Technology.com. Archived from the original on 28 February 2018. Retrieved 12 May 2014. ^ "Delhi Metro says no to Maglev technology". The Indian Express. New Delhi. 8 August 2012. Archived from the original on 1 February 2016. Retrieved 22 January 2018. ^ P. Manoj (25 August 2005). "BEML to rake in big money from proposed metro projects". The Hindu. Archived from the original on 28 March 2008. Retrieved 26 September 2009. ^ a b "Second Metro rail arrives in Delhi". The Times of India. 15 October 2002. Retrieved 26 September 2009. ^ a b c d "Rolling Stock: Ensuring Passenger Comfort, Safety and Reliability" (jpg). DMRC. Archived from the original on 21 October 2010. Retrieved 27 September 2010. ^ "Metro Rail gets first train". The Hindu. 27 July 2002. Archived from the original on 8 July 2011. Retrieved 26 September 2009. ^ "Bombardier to Deliver Further 76 MOVIA Metro Cars to Delhi Metro from Savli India Site". Press Release. Bombardier. 5 September 2011. Archived from the original on 16 November 2011. Retrieved 3 November 2011. ^ "Bombardier to supply coaches to Delhi Metro". projectsmonitor.com. Archived from the original on 14 January 2010. ^ "Metro to get swankier, bigger coaches". The Times of India. 17 September 2009. Retrieved 26 September 2009. ^ "BEML delivers India's 1st standard gauge metro car". The Economic Times. New Delhi. 11 September 2009. Archived from the original on 15 January 2018. Retrieved 15 January 2018. ^ Ramachandran, Smriti Kak (30 July 2009). "Trial run begins on first standard gauge Metro line". The Hindu. New Delhi. Archived from the original on 3 March 2018. Retrieved 15 January 2018. ^ "Airport line handed over to Reliance Infra". The Indian Express. 20 May 2010. Archived from the original on 5 September 2010. Retrieved 5 June 2010. ^ "Delhi Airport line contracts finalised" (PDF). Construcciones y Auxiliar de Ferrocarriles. Archived from the original (PDF) on 18 July 2011. ^ "Technical Notes: Signalling". DMRC. Archived from the original on 12 March 2008. Retrieved 23 November 2009. ^ "Delhi Metro Railway Corporation, India" (PDF). Motorola Electronics. Archived from the original (PDF) on 4 October 2012. Retrieved 3 January 2010. ^ "Metro Line 3, New Delhi, India". Siemens AG. Archived from the original on 11 December 2008. Retrieved 6 July 2008. ^ "Technical Notes: Telecommunication". DMRC. Archived from the original on 26 December 2007. Retrieved 23 November 2009. ^ "Delhi Airport Metro Express". Delhi metro times. Archived from the original on 20 January 2015. Retrieved 4 August 2012. ^ "Reliance Metro Airport Express, WiFi-enabled, EVS Chakravarthy, CEO YOU Broadband". Business Wire India. Retrieved 22 August 2018. ^ "Delhi Metro launches WiFi on Blue Line stations". Economic Times. 25 August 2017. Retrieved 22 August 2018. ^ "Delhi Metro offered fully-automated, driverless train system". Archived from the original on 29 January 2014. Retrieved 25 May 2012. ^ "Delhi Metro gets UN certificate for preventing carbon emission". The Times of India. New Delhi. 22 February 2009. Archived from the original on 17 May 2014. Retrieved 15 January 2018. ^ a b "Delhi Metro gets OHSAS 18001". DMRC. Archived from the original on 7 June 2008. Retrieved 10 September 2009. ^ "Press Release: Delhi Metro Receives ISO 14001 For Eco-friendly Systems". USAID. 24 December 2002. Archived from the original on 13 September 2009. Retrieved 27 September 2010. ^ "Delhi Metro shows the way with water harvesting units". The Times of India. 26 September 2005. Retrieved 27 September 2010. ^ "Delhi Metro is first rail project to earn carbon credits". The Economic Times. New Delhi. 5 January 2008. Archived from the original on 22 January 2018. Retrieved 22 January 2018. ^ Sinha, Neha (20 December 2009). "Delhi Metro on track to earn carbon credits". The Indian Express. New Delhi. Archived from the original on 23 January 2018. Retrieved 22 January 2018. ^ "Metro mulls solar panels at stations to go green". The Times of India. New Delhi. 5 June 2012. Archived from the original on 22 January 2018. Retrieved 22 January 2018. ^ "Delhi Metro to install three new solar power plants". Biharprabha. New Delhi: Biharprabha. 3 July 2014. Archived from the original on 15 July 2014. Retrieved 22 January 2018. ^ Shaikh, Ateeq (23 March 2017). "Airports, hospitals light up 40 gw rooftop solar plan". Daily News and Analysis. Archived from the original on 15 January 2018. Retrieved 22 January 2018. ^ Mukherjee, Anuradha (13 December 2002). "Vibrant murals bring cheer". The Times of India. New Delhi. Archived from the original on 22 January 2018. Retrieved 22 January 2018. ^ Preeti Jha (10 October 2007). "Murals by Salwan Public School students decorate Metro pillars on Pusa Road". The Indian Express. Archived from the original on 14 October 2012. Retrieved 2 February 2010. ^ "At INA Metro station, a gallery for traditional art, crafts". The Indian Express. New Delhi. 2 September 2010. Archived from the original on 1 February 2016. Retrieved 22 January 2018. ^ Smriti Kak Ramachandran (2 September 2010). "Delhi metro gets a handicrafts gallery". The Hindu. Archived from the original on 29 June 2011. Retrieved 21 September 2010. ^ "Delhi airport bags Golden Peacock National Quality Award - Times of India". The Times of India. Retrieved 1 March 2019. ^ September 21, P. T. I.; September 21, 2016UPDATED:; Ist, 2016 23:00. "DMRC receives Outstanding PSU of year award". India Today. Retrieved 1 March 2019. ^ "Japanese award to DMRC". Deccan Herald. 30 October 2012. Retrieved 1 March 2019. Rashmi Sadana (30 May – 2 June 2012). "Metrocity Journal: Up, Up and Away". The Wall Street Journal. Rashmi Sadana (13 November 2010). "On the Delhi Metro: An Ethnographic View". Economic and Political Weekly. 45 (46): 77–83. G. S. Dhillon (29 January 2004). "Trenchless tunnelling". The Tribune. A dream revisited: an archival journey into the making of the Delhi Metro Rail. DMRC. 2003. OCLC 54073649. A journey to remember. DMRC. 2008. p. 94. OCLC 300027063.